Re-reading the Fantastic Four comics from the start. We’re making our way through an exciting time, as previous weeks have had the debuts of Galactus, the Silver Surfer, the Inhumans, and the Black Panther. Issue #54 gives us the historic first appearances of… Prester John and the Evil Eye! I guess they can’t all be winners. As the story begins, our heroes are still visiting the African nation of Wakanda, where they have invited the Black Panther and the Wakandans to join them in a friendly game of baseball, which is this issue’s excuse-for-the-characters-to-show-off-their-powers-for-a-few-pages thing. We actually haven’t had one of those in a while. Later, everyone enjoys a fancy dinner at the Panther’s palace, but Johnny doesn’t seem interested. His friend and tagalong Wyatt Wingfoot suspects something is wrong. 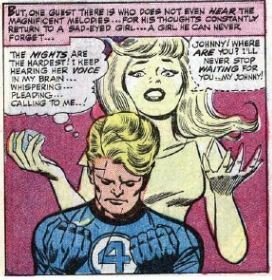 Johnny is, of course, pining after Crystal, the one-time love of his life who is now separated from him. On that cue, we rejoin Crystal and the rest of the Inhumans, with their entire city still trapped under a giant impenetrable dome. The Inhumans’ silent leader, Black Bolt, is determined to find a way out. The only person smart enough to escape, the Inhumans say, is the one created the dome – Black Bolt’s evil brother, Maximus. Problem is, Maximus’s brain has reverted to a childlike state (when did this happen? ), so he just sits around his jail cell making high-tech kites. Gorgon (remember him? He once singlehandedly defeated the FF) tries to convince Maximus to invent something that will shatter the surface of the dome. Back in Wakanda, the Black Panther gives our heroes some wondrous gifts. Reed and Sue get clothes, which Reed says are the latest fashions from Paris (! ), Johnny gets a supersonic fishing net (? ), Wyatt gets a book of athletic records that mentions his famous athlete father (the Panther just had this lying around?) and Ben gets a cool-looking exercise machine to make him even stronger. By now, the Black Panther can also tell Johnny has the blues. That’s when Johnny drops the bombshell – he’s not going home with the rest of the team. He wants to go back the Inhumans’ city and find a way through that dome. Wyatt agrees to tag along and help him. (The Native American Wyatt actually compares himself to Tonto in one line. I’ll let you draw your own conclusions.) Then the Black Panther makes with another gift, a futuristic Gyro-cruiser! It’s like a spaceship enclosed in a glass dome. The Panther says it runs on “a magnetic-tension element energized by friction.” Because of course it does. Johnny and Wyatt take off in their new ship (it must be really easy to fly) and they are immediately caught in a sandstorm, which draws them deep into an underground cavern. There, they go exploring and come across a giant crypt. Inside, they find a man dressed as a medieval knight, apparently sleeping. But no, the knight wakes and catches them by surprise, zapping them with an eye-shaped weapon. His name is Prester John, and he’s been asleep down there for 700 years (the “chair of survival” kept him alive the whole time). John is from Avalon, ancestral home of the knights, which in this story was rules not by King Arthur but by King Richard. John traveled the world, soaring on flying carpets and battling yetis. To protect the wonders of Avalon from the outside world, the wizards of Avalon created John’s weapon, the Evil Eye. The Eye can fire powerful disintegrator rays, and it traps Johnny and Wyatt in a barrier just like the one holding the Inhumans. Speaking of the Inhumans, we cut back to them, where we learn the aquatic Inhuman Triton now has an apparatus that allows him to exist outside of water. (He’s a real boy now!) Gorgon is outraged that Maximus has invented this instead of a way out of the dome. Gorgon is about to attack Maximus, but Black Bolt intervenes, protecting his brother. Back with Johnny, then. Prester John’s attack was just a demonstration of his power, and he says he would not actually hurt Johnny or Wyatt because of his chivalrous code. Johnny wants to borrow the Evil Eye, believing it can free the Inhumans. Prester John refuses, so the Torch takes the Eye by force and flies off with it (Never thought I’d write that sentence). Prester John freaks out, because if the Eye is out of his control for too long, it will overload and explode. Then we’re with the Inhumans again, where Black Bolt has decided to go to extreme lengths to free his people, by entering the “cyclo-electronic chamber.” (Being mute, Black Bolt doesn’t say any of this, so it’s up to the other Inhumans to follow him around and narrate everything he does.) 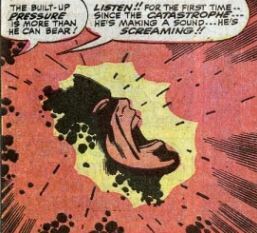 Inside the chamber, Black Bolt channels all of his power and energy into an “absorba-bomb,” but the pain is too much for him and he screams. That right, Marvel fans, he screams. On that note, the Inhumans’ subplot ends. We won’t learn the outcome of this for quite a few issues. Unstable molecule: Reed and Sue sit out most of the issue, with one throwaway line of how they still haven’t taken their honeymoon. Fade out: During the baseball game, Sue turns invisible and trips Reed to punish him for cheating. What do you call playing while invisible? Clobberin’ time: Ben’s weightlifting gizmo is described as “the most powerful portable exerciser on Earth.” He grouses about it, but then thinks to himself that it’s pretty great. 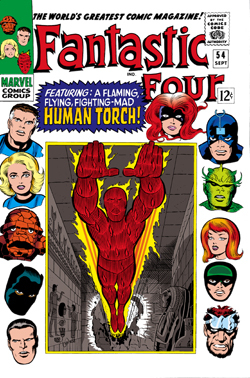 Flame on: This is pretty much a Human Torch solo issue, which showcases the new “grown-up” Torch, willing to sacrifice anything to save the girl he loves. Trivia time: The character of Prester John is based on one out of actual folklore. There are a lot of stories about the guy, but the gist of it is that he was one of three knights, or three magi, who guarded a vast and amazing treasure. I can’t possibly be the only one reminded of Indiana Jones and the Last Crusade, am I? 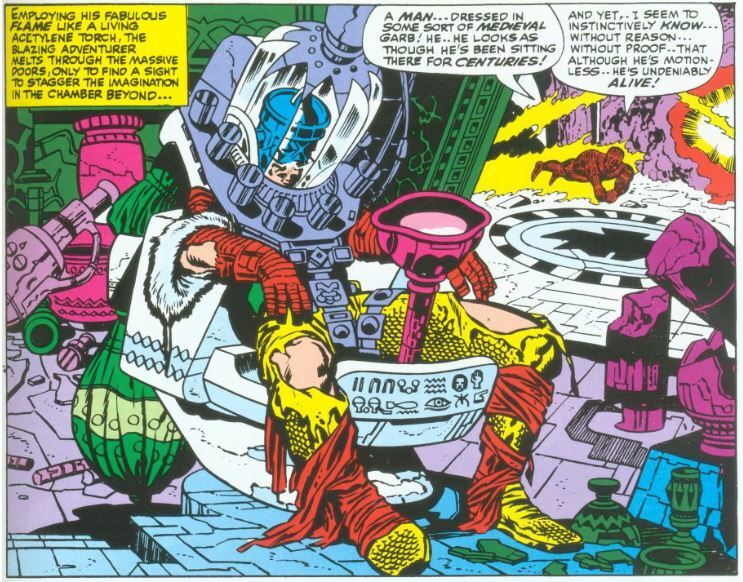 Prester John never became a Marvel mainstay, but he’s shown up from time to time over the years, having adventures with Thor, Iron Man, and even Deadpool! There are references in this and previous issues to Black Bolt being “mute” and “unable to speak.” This goes against what is later established about his powers, and I wonder how/when the big reveal will be handled. Fantastic or frightful? What a crazy issue! With Wakanda, the Inhumans’ city, and Avalon, there are three secret, high-tech cities hidden away from the rest of civilization, all in one story. 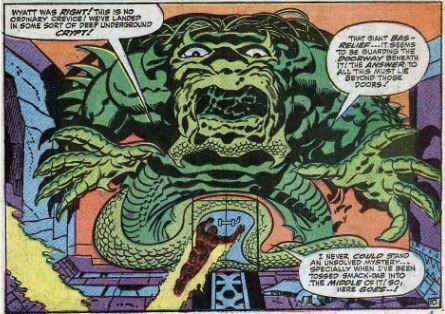 What really makes the issue work, though, is Jack Kirby’s eye-popping art (he’s really off the chain by this point, and every page is a stunner), and Johnny’s heartbreak at the end, which is a total gut-punch. Next: Ya blasted silver skunk!